August 16th, 2014 – Silopanna Music Festival is back. Just a reminder, it’s Annapolis spelled backwards! Most of the bands have already been announced. Line-up (as of April 21st, 2014): Flaming Lips, Dashboard Confessional, Matt + Kim, Sleeper Agent, Hellogoodbye, Jimmie’s Chicken Shack, Chappo, Twin Forks, Damn Right!, Pasadena, Sweet Leda, Higher Hands, Sun Club, Little Bird, Skribe, The Baby Grand, Brothers Clair, and School of Rock! For more information, check out the official website: Silopanna Music Festival 2014. Sherwood enlisted the help of the multi-talented Matt Wignall best known for his work with the Cold War Kids (mattwignall.com) to direct the video for the first single off their latest release, Qu – out now on MySpace Records. Hellogoodbye has a brand new music video for the equally brand new song “When We First Met.” It is currently being premiered exclusively via MySpace: http://vids.myspace.com/index.cfm?fuseaction=vids.individual&videoid=63495018. Additionally, the band will be releasing a Free EP for “When We First Met” which includes, the MP3, an iPod-sized version of the video, plus the b-side “Not Ever Coming Home.” The EP will be sent out via the band’s newsletter on Tuesday, September 29. To receive the EP, fans can simply sign-up for the band’s newsletter before Tuesday, here: http://hellogoodbye.net/. California alterna-popsters Sherwood announce the release of their highly anticipated new album Qu out October 13th on MySpace Records. Recorded in Los Angeles with renowned producer Brad Wood (Liz Phair, Smashing Pumpkins, Sunny Day Real Estate) the album features 11 original tracks written by all five members. The result is a refreshingly catchy and precise pop record. Sherwood will be hitting the road on September 17th when they join Better Than Ezra for some select dates before heading out on a full tour of North America with Hanson, Hellogoodbye and Steel Train that kicks off September 30th at Cain’s Ballroom in Tulsa, OK and takes them through November. Hellogoodbye is preparing to hit the road headlining their End of Summer West Coast Tour along with Fun before joining Hanson and others on the Use Your Sole Tour (Hanson, Steel Train, Sherwood) later this fall; tickets for the fall trek are on sale now. Preparing the release of When We First Met, the Long Beach, California band will proudly be representing the West Coast with Fun, Limbeck, and My Favorite Highway on their headlining tour aptly called End of Summer West Coast Tour. New Jersey lovers HOUSTON CALLS’ latest and greatest, The End of an Error releases October 14, 2008. The End of an Error CD release performance and signing is at Vintage Vinyl October 13th at 7pm. Vintage Vinyl is located at 51 Lafayette Rd in Fords NJ. HOUSTON CALLS will tour the UK October 15-30. 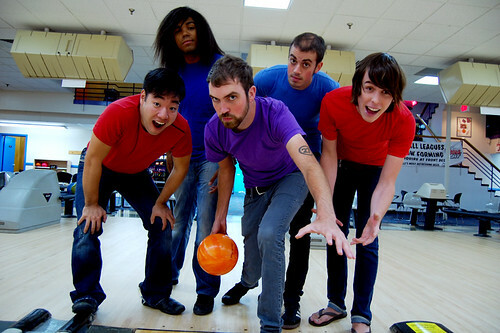 Their last stint was two weeks of sold out shows in support of Hellogoodbye and Plain White T’s. After wrapping in the UK, the band will tour the US until the end of the year and then off to Australia. Platinum selling artist HELLOGOODBYE is hitting the road on a US tour this fall October 23 through November 28, 2008. Always ready to do their part, HELLOGOODBYE will travel to the 25 dates in a veggie oil/bio-diesel converted van. Longtime buddies of the band and tour sponsor peta2 will be present at each show with an info booth promoting their new “Meat’s Not Green” campaign. Members of HELLOGOODBYE’S fan club can purchase presale tickets on Thursday September 11 at 12pm local time on www.ducatking.com. General sale begins Saturday September 13 at 10am local on www.ducatking.com. A lot has happened to HELLOGOODBYE since the release of their 2006 album, Zombies! Aliens! Vampires! Dinosaurs! Original members Forrest Kline (lead singer and guitar) and Chris Profeta (drums) are joined by new members Travis Head (bass), Ryan Daly (guitar), and formerly of The Early November, Joe Marro (keyboards). The group is writing and recording in Forrest’s recording in-house studio and will be performing new material along with old fan faves on this tour.